Danita has been on Drupal.org and working with Drupal full-time for 4 years. 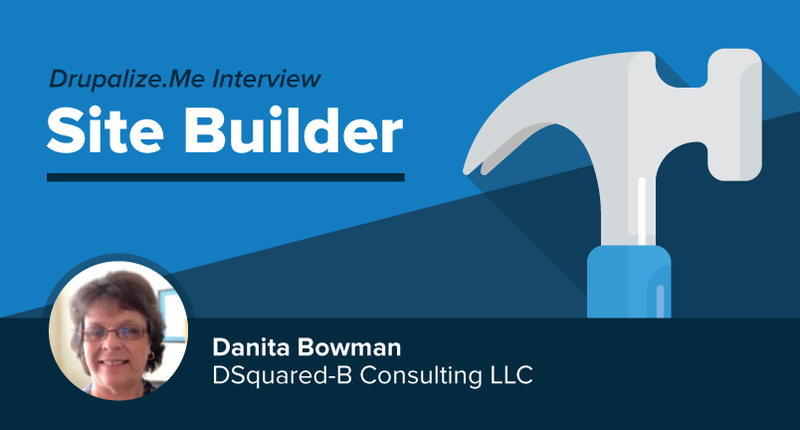 In this interview she answers some questions for us about being a site builder. Meet Danita! A Drupal site builder is someone who is able to assemble core and contributed modules to create a functional website. The site builder doesn’t need to know how to code, but does need a basic understanding of web technologies, best practices, how to evaluate contributed modules for stability, etc., and how to leverage contributed modules to build functionality. I build, update, and manage Drupal websites for medium-sized organizations and businesses. Most days I begin by reviewing and responding to new client requests for changes/updates to their website and determine how to fit those requests into my schedule. As a freelancer, some days (or parts of days) are also spent preparing proposals/estimates and contracts for upcoming work. I will typically knock out quick tasks first so I can concentrate blocks of time on larger, more complex tasks. On a daily basis, I interpret a client’s want list (either for a full site build or an update) into Drupal-ese (how to accomplish it the Drupal way), and install or configure modules to provide the functionality the client needs. This can be anything from creating a new View or adding a new content type or taxonomy group to installing and configuring new modules. Since there is rarely a “recipe” to follow to build more complex functionality, I spend a fair amount of time researching modules, reading forum and blog posts, and testing modules to see if they will do what I think they will do. I concentrate on building the functionality of websites. I work with clients to determine project requirements, then hand off design to a freelancer I partner with. Once a site/project design is agreed on, I will create the basic structure and functionality of the site. This includes whether or when to use Panels or blocks and creating content types, Views, image styles, etc. I do just enough theming to be dangerous so my partner takes over on theming after I mess it up. My strongest skill is probably analysis. I have needed to listen to client needs and analyze how to turn those needs into a project. I have needed to look at modules and analyze whether they would do what I needed and if they were viable options. I’ve honed that skill by practice and not jumping in to a project too quickly - although a few times of going down the wrong path too quickly will definitely teach you a lesson or two. I’m pretty atypical in the Drupal world for a site builder/developer. I’m an older woman without a coding background or a CS degree and my previous jobs were not in technical fields. I had a variety of jobs over the years where I was often tasked with overseeing websites. At my last job (before freelancing), I managed a website that was migrated to Drupal. When I got impatient waiting for someone to make changes to the website, I started learning how to do more than just editing content, which led to playing around with building full websites. I ended up building another small Drupal website for a special event for that job and really enjoyed it. When that job ended and I was looking for my next opportunity, I decided to work for small businesses managing their websites and social media. Many small businesses didn’t have websites and asked me to build them one. My projects got increasingly larger until I eventually had more medium-sized clients than small businesses. Without a coding background, the biggest challenge I faced as a beginning site builder was not being a coder. While you can do lots with Drupal without writing any code, you will still have to know or learn something about php and css and html to build a site that is more than just core, a few modules, and one of the themes included with core. My favorite resources have been Drupalize.Me and BuildAModule.com, which I used extensively when I was beginning, along with Google and Drupal.org. There are a number of other resources, blogs and such that have come and gone over the years, but I lot of those I have found through Google searches. For tools, I use a Mac and my favorites, or what I end up using most are TextMate (text editor), MAMP and Kalabox for my local development environments, Cyberduck for transferring files (SFTP), and Drush and Git. I also couldn’t get by without browser add-ons like Firebug for Firefox or other developer tools. If I started out again today with a non-coding background, I would probably start with learning more about php before or while I was learning to install and configure modules. There comes a point once you start site building that you have to at least understand what code is doing. As you get into more complex functionality and theming, you have to know how to create and edit templates, add plug-ins, patch modules, and write some “glue-code”, or you are stuck building simple brochure sites. Find a good mentor. Don’t be a pest in forums or issue queues or on IRC asking questions you haven’t researched for yourself first. Be willing to research and experiment yourself, but find someone that will let you bounce questions or ideas off of them. Spend time reading blog posts and watching instructional videos. Learn Drupal best practices - the Drupal way of doing things - and don’t think because you have may have built websites with another CSS or technology that you can do just do it anyway you please.